The Governor of West Papua, Dominggus Mandacan, wants the community and all elements to be more resilient in facing the threat of natural disasters in the area. “West Papua is not only prone to earthquakes and tsunamis. We also have the potential for floods and landslides. There is no other way besides that, we must be prepared and more resilient in the face of disasters,” the governor said in Manokwari on Wednesday. “The resilience in facing the disaster must continue to be trained because for West Papua Province this is a necessity. I, as the governor, is very grateful to the Commander of the Military District and the entire ranks,” said the governor. He hoped that this exercise would run smoothly and get maximum results. The participants were encouraged to take part in the whole series of activities to be more skilled and alert when a disaster occurs. “This is because it is driven by the guidance of development and the economic demands of the community, but we also do not necessarily. In land conversion we always ask for approval from the Ministry of Environment and Forestry,” the governor said. The Governor realizes that the use of this area has the potential to cause disaster vulnerability. At present the local government is reviewing the West Papua RTRW. Efforts to refine the RTRW document are ongoing and are expected to be completed as soon as possible. After the RTRW of the results of the results was passed, he invited all parties to obey including the district / city government. “Which should be protected which can be used to develop the economy. Land use must be done carefully so as not to cause natural disasters,” said the governor. In handling the disaster, the governor continued, the West Papua Provincial Government already had regional regulations (Perda) and governor regulations as technical instructions. This integrated exercise involving many elements is considered to be very supportive of the efforts of regional governments in disaster management. He hopes that similar exercises can be carried out at the district / city level, as well as involving the community, especially in the most disaster-prone areas. 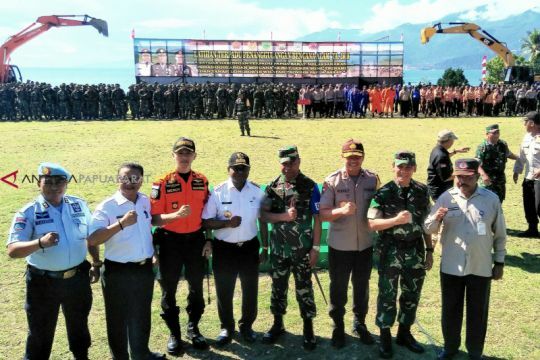 The integrated training centered in Manokwari and Sorong involved TNI personnel, National Police, Regional Disaster Management Agency, Office of Search and Relief (Basarnas) and other agencies such as the National Electricity Company (PLN), PT Telkom Indonesia, Scouts, Orari, Rapi. In addition to the theory, participants who have been divided based on their respective functions and roles will follow a series of field activities related to disaster management. Participants will practice their respective situations and roles such as when they are truly in a disaster situation.